(NaturalNews) Residents living in Napa County California are at an increased risk for many different cancers. A new eight page health report released by the Cancer Registry of Greater California finds that Napa Valley is a cancer cluster, harboring high rates of people suffering with cancer. Reports like these should sound the alarm and motivate us to investigate the environmental causes. We can no longer blindly proclaim that cancer runs in the family and there's nothing that we can do. Carcinogens are being used en masse, without our consent - constantly approved all in the name of SCIENCE! These carcinogens are being mass produced and sprayed all over the crops and the land, all for CORPORATE INTEREST. The scathing report, presented to the Napa county Board of Supervisors, shows that Napa Country has the highest age-adjusted incident rates of cancer among all the 58 counties in California. Colorectal cancer and female breast cancer rates were abnormally high while pancreatic cancer and prostate cancer rates were through the roof in Napa Valley. For every 100,000 people in the county there are an astonishing 487.7 documented cases of cancer. Seeking answers for Napa Valley, Dan Mufson of Napa Vision 2050 bravely brought up the cancer issue, but the report he got back from the state failed to deliver. The report vaguely said, "Overall, the patterns found in the incidence and mortality rates of Napa County are consistent with what would be expected for a higher-than-average socio-economic status population receiving better-than-average cancer screening and access to care." But the inquisitive Mufson asks, "The question still is, why is Napa County number one?" One of the issues brought up was the Syar quarry, which lets off toxic mining dust that drifts from the quarry to nearby neighborhoods and schools. Consequentially, the area has unusually high rates of childhood cancers and respiratory problems. Even so, the report concluded that an environmental investigation or air monitoring is not necessary. Instead, the report suggested the same apathetic, cover up that brushes the real issues aside. The report said that concerned people should have a talk with their doctor to discuss genetic risk factors for cancer. The gravest problem that is being swept under the rug is the issue of pesticide-laden vineyards, polluting the water and the soil of Napa Valley. These silent toxins are infiltrating the cells of the region's people, overburdening people's bodies with unsafe, unstudied, compounding, and intermixing chemicals. Studies on pesticides in other countries have yielded startling findings. For example, hair samples taken from schoolchildren in the French region of Gironde show the presence of 40 dangerous chemicals linked to neighboring vineyards that rely heavily on pesticide spraying. The region is suffering from abnormal leukemia rates; overall the region has a 20 percent higher leukemia rate than the rest of the country. The real bombshell is that the childhood leukemia rates are a nasty 500 percent higher right down in the "pristine" wine region of Sauternes. After a French television documentary came out linking pesticide-laden vineyards with high cancer rates nearby, protests erupted in the French wine region of Bordeaux. 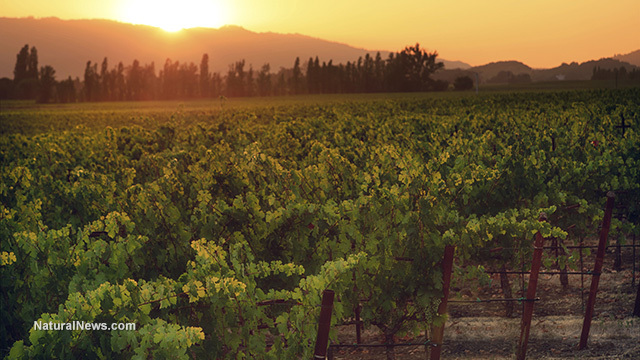 Erroneously, the same pesticides used in Bordeaux are also used in Napa Valley. Consequentially, Napa County California is also seeing similar spikes in childhood cancer cases. Through 2000 and 2012, the county produced a sickening 69 percent rise in childhood cancer deaths. Now Napa County sees 22.8 child cancer deaths per 100,000 children. By studying these cancer clusters, it becomes obvious that pesticide intense regions come at a cost – increased cancer and childhood death. This is what modern day "science" have become – death machines, sacrificing human life for the advancement of industry. Will we wake up in time and see the hell we are creating on this beautiful planet?